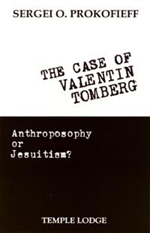 Born in 1900 in Russia, Valentin Tomberg was for many years an enthusiastic student of Anthroposophy. In 1945, however, he converted to Roman Catholicism and completely turned his back on the former phase of his life. By the time of his death in 1973 he had written two major works Meditations on the Tarot and Covenant of the Heart in which he presents much esoteric knowledge, but now under the spiritual authority of the Catholic Church. What is the mystery behind Tomberg's life? Prokofieff provides answers in this forcefully argued and uncompromising book.